Download "SANTA CRUZ CITY SCHOOLS POLICY 5030. Integrated Wellness Policy"
1 SANTA CRUZ CITY SCHOOLS POLICY 5030 Integrated Wellness Policy Mission The educational mission of the Santa Cruz City School District includes improving the health and wellness in our community by teaching students to establish and maintain life-long healthy eating and physical activity habits. The mission shall be accomplished through nutrition education, physical education, Life Lab garden experiences, foods and beverages served in schools, environmental education, psychological and counseling services, health promotion for staff, a safe and healthy school environment, core academic content in the classroom, and family/parent/community collaboration. 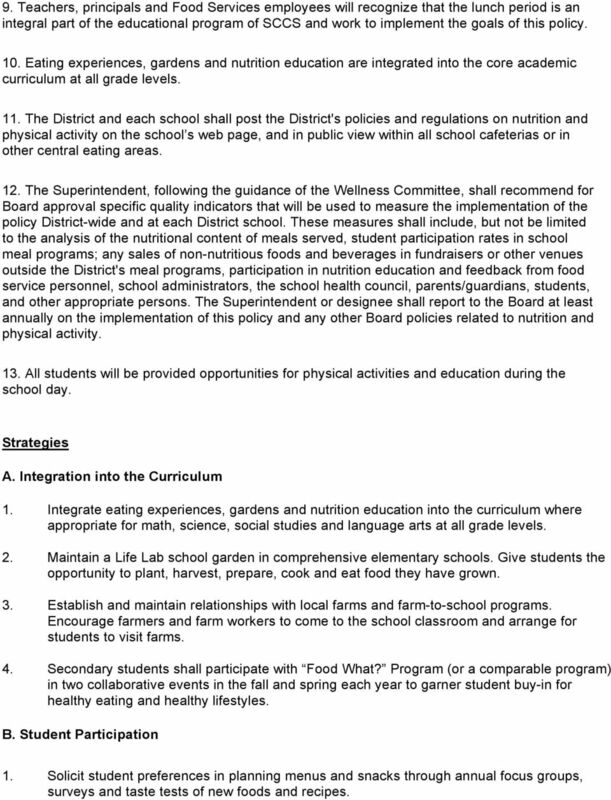 Statement of Principles The Governing Board recognizes that there is a link between nutrition education, the foods and beverages served in schools, physical activity, environmental education and academic achievement. The Board also recognizes the important connection between a healthy diet, physical activity and a student s ability to learn effectively and achieve high standards in school. 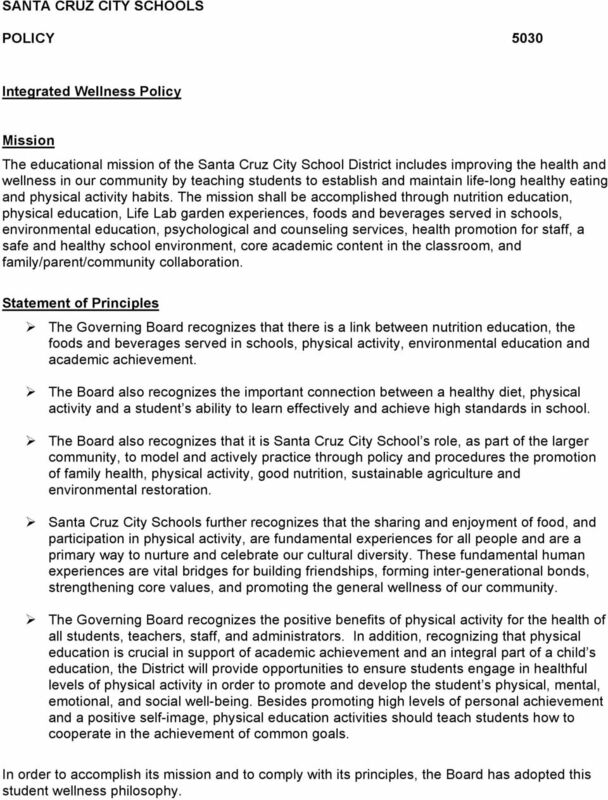 The Board also recognizes that it is Santa Cruz City School s role, as part of the larger community, to model and actively practice through policy and procedures the promotion of family health, physical activity, good nutrition, sustainable agriculture and environmental restoration. Santa Cruz City Schools further recognizes that the sharing and enjoyment of food, and participation in physical activity, are fundamental experiences for all people and are a primary way to nurture and celebrate our cultural diversity. These fundamental human experiences are vital bridges for building friendships, forming inter-generational bonds, strengthening core values, and promoting the general wellness of our community. The Governing Board recognizes the positive benefits of physical activity for the health of all students, teachers, staff, and administrators. In addition, recognizing that physical education is crucial in support of academic achievement and an integral part of a child s education, the District will provide opportunities to ensure students engage in healthful levels of physical activity in order to promote and develop the student s physical, mental, emotional, and social well-being. Besides promoting high levels of personal achievement and a positive self-image, physical education activities should teach students how to cooperate in the achievement of common goals. In order to accomplish its mission and to comply with its principles, the Board has adopted this student wellness philosophy. 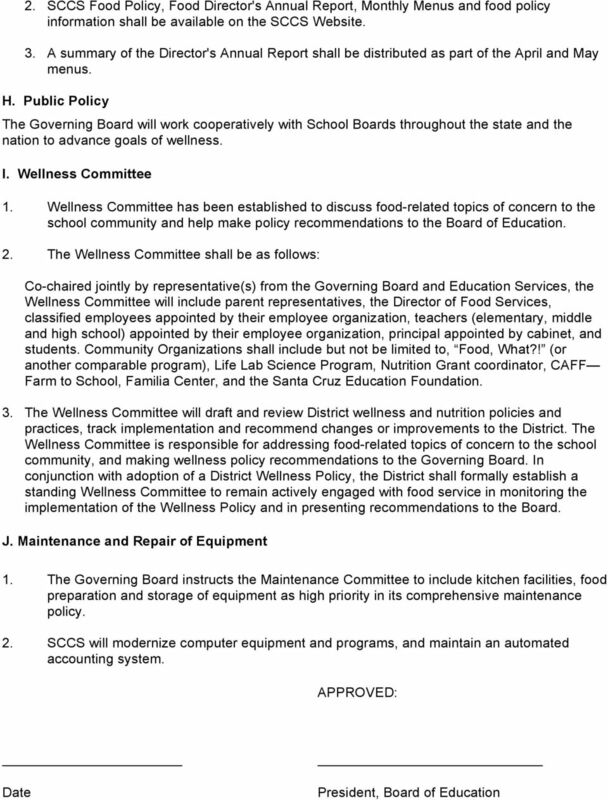 2 Wellness Goals To help ensure the wellness of each student attending Santa Cruz City Schools (SCCS) and to provide guidance to school personnel in the areas of nutrition, health, physical activity and food service the Board subscribes to the following as guided by the District Wellness Committee. 1. 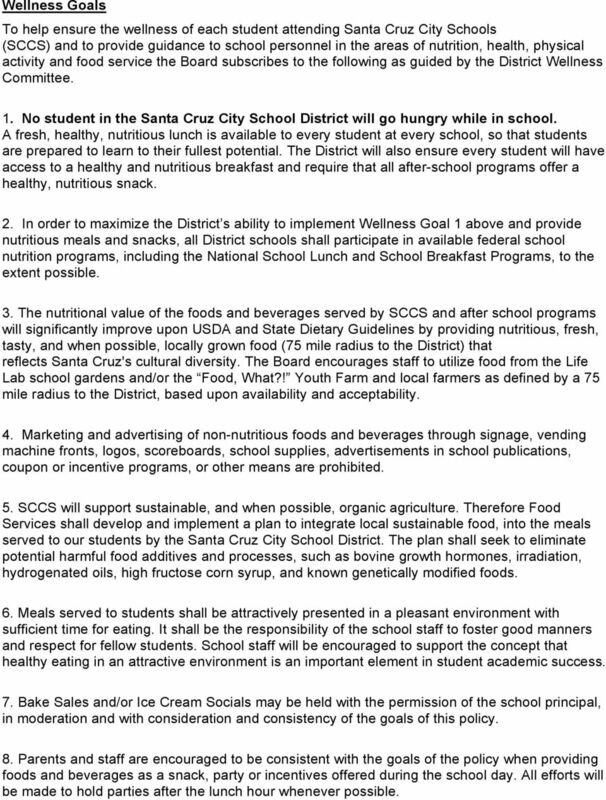 No student in the Santa Cruz City School District will go hungry while in school. A fresh, healthy, nutritious lunch is available to every student at every school, so that students are prepared to learn to their fullest potential. The District will also ensure every student will have access to a healthy and nutritious breakfast and require that all after-school programs offer a healthy, nutritious snack. 2. In order to maximize the District s ability to implement Wellness Goal 1 above and provide nutritious meals and snacks, all District schools shall participate in available federal school nutrition programs, including the National School Lunch and School Breakfast Programs, to the extent possible. 3. The nutritional value of the foods and beverages served by SCCS and after school programs will significantly improve upon USDA and State Dietary Guidelines by providing nutritious, fresh, tasty, and when possible, locally grown food (75 mile radius to the District) that reflects Santa Cruz's cultural diversity. The Board encourages staff to utilize food from the Life Lab school gardens and/or the Food, What?! Youth Farm and local farmers as defined by a 75 mile radius to the District, based upon availability and acceptability. 4. Marketing and advertising of non-nutritious foods and beverages through signage, vending machine fronts, logos, scoreboards, school supplies, advertisements in school publications, coupon or incentive programs, or other means are prohibited. 5. SCCS will support sustainable, and when possible, organic agriculture. 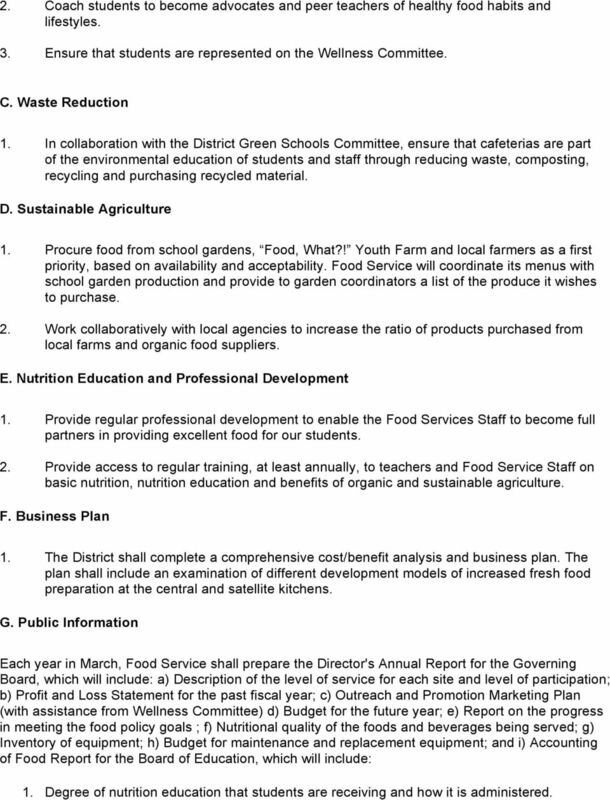 Therefore Food Services shall develop and implement a plan to integrate local sustainable food, into the meals served to our students by the Santa Cruz City School District. The plan shall seek to eliminate potential harmful food additives and processes, such as bovine growth hormones, irradiation, hydrogenated oils, high fructose corn syrup, and known genetically modified foods. 6. Meals served to students shall be attractively presented in a pleasant environment with sufficient time for eating. It shall be the responsibility of the school staff to foster good manners and respect for fellow students. School staff will be encouraged to support the concept that healthy eating in an attractive environment is an important element in student academic success. 7. Bake Sales and/or Ice Cream Socials may be held with the permission of the school principal, in moderation and with consideration and consistency of the goals of this policy. 8. Parents and staff are encouraged to be consistent with the goals of the policy when providing foods and beverages as a snack, party or incentives offered during the school day. All efforts will be made to hold parties after the lunch hour whenever possible. 3 9. Teachers, principals and Food Services employees will recognize that the lunch period is an integral part of the educational program of SCCS and work to implement the goals of this policy. 10. Eating experiences, gardens and nutrition education are integrated into the core academic curriculum at all grade levels. 11. The District and each school shall post the District's policies and regulations on nutrition and physical activity on the school s web page, and in public view within all school cafeterias or in other central eating areas. 12. The Superintendent, following the guidance of the Wellness Committee, shall recommend for Board approval specific quality indicators that will be used to measure the implementation of the policy District-wide and at each District school. These measures shall include, but not be limited to the analysis of the nutritional content of meals served, student participation rates in school meal programs; any sales of non-nutritious foods and beverages in fundraisers or other venues outside the District's meal programs, participation in nutrition education and feedback from food service personnel, school administrators, the school health council, parents/guardians, students, and other appropriate persons. The Superintendent or designee shall report to the Board at least annually on the implementation of this policy and any other Board policies related to nutrition and physical activity. 13. All students will be provided opportunities for physical activities and education during the school day. Strategies A. Integration into the Curriculum 1. Integrate eating experiences, gardens and nutrition education into the curriculum where appropriate for math, science, social studies and language arts at all grade levels. 2. Maintain a Life Lab school garden in comprehensive elementary schools. Give students the opportunity to plant, harvest, prepare, cook and eat food they have grown. 3. Establish and maintain relationships with local farms and farm-to-school programs. Encourage farmers and farm workers to come to the school classroom and arrange for students to visit farms. 4. Secondary students shall participate with Food What? Program (or a comparable program) in two collaborative events in the fall and spring each year to garner student buy-in for healthy eating and healthy lifestyles. B. Student Participation 1. Solicit student preferences in planning menus and snacks through annual focus groups, surveys and taste tests of new foods and recipes. 4 2. Coach students to become advocates and peer teachers of healthy food habits and lifestyles. 3. Ensure that students are represented on the Wellness Committee. C. Waste Reduction 1. In collaboration with the District Green Schools Committee, ensure that cafeterias are part of the environmental education of students and staff through reducing waste, composting, recycling and purchasing recycled material. D. Sustainable Agriculture 1. Procure food from school gardens, Food, What?! Youth Farm and local farmers as a first priority, based on availability and acceptability. Food Service will coordinate its menus with school garden production and provide to garden coordinators a list of the produce it wishes to purchase. 2. Work collaboratively with local agencies to increase the ratio of products purchased from local farms and organic food suppliers. E. Nutrition Education and Professional Development 1. Provide regular professional development to enable the Food Services Staff to become full partners in providing excellent food for our students. 2. Provide access to regular training, at least annually, to teachers and Food Service Staff on basic nutrition, nutrition education and benefits of organic and sustainable agriculture. F. Business Plan 1. The District shall complete a comprehensive cost/benefit analysis and business plan. The plan shall include an examination of different development models of increased fresh food preparation at the central and satellite kitchens. G. Public Information Each year in March, Food Service shall prepare the Director's Annual Report for the Governing Board, which will include: a) Description of the level of service for each site and level of participation; b) Profit and Loss Statement for the past fiscal year; c) Outreach and Promotion Marketing Plan (with assistance from Wellness Committee) d) Budget for the future year; e) Report on the progress in meeting the food policy goals ; f) Nutritional quality of the foods and beverages being served; g) Inventory of equipment; h) Budget for maintenance and replacement equipment; and i) Accounting of Food Report for the Board of Education, which will include: 1. Degree of nutrition education that students are receiving and how it is administered. MSAD# 8 Vinalhaven NEPN/NSBA- JL STUDENT WELLNESS The Board recognizes that student wellness and good nutrition are related to students physical and psychological well being and their readiness to learn. WELLNESS POLICY. B. Support and promote proper dietary habits contributing to student and staff health status and students academic performance. GENERAL ASSEMBLY OF NORTH CAROLINA SESSION 2015 HOUSE DRH30224-LE-104 (03/27) Short Title: Healthy and High-Performing Schools. Putney Central School is seeking a chef who loves kids! Make a Difference at Your School! FACT SHEET. Farm to School Grant Program. Funding Information and Application Requirements. (949) 589-6338 u www.blaisassoc. Policy Evaluation Report Implementation of Board of Education Policy JPG, Wellness: Physical and Nutritional Health Department of Policy, Records, and Reporting September 2009 Suzanne R. Merchlinsky, M.A. HealthierUS School Challenge: Smarter Lunchrooms (HUSSC: SL) Webinar.